FALL RIVER — Bishop Edgar M. da Cunha, S.D.V., will award the Marian Medal to 79 laypersons from parishes throughout the Fall River Diocese at 3 p.m. on Sunday, November 18, at the Cathedral of St. Mary of the Assumption, 327 Second Street, Fall River. The medals will be blessed and presented in the context of Evening Prayer of the Church and Eucharistic Adoration and Benediction of the Blessed Sacrament. 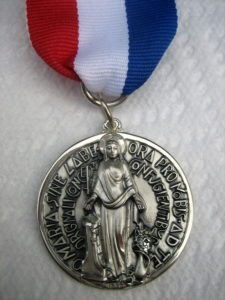 The Marian Medal recipients for 2018 are listed below by deanery or area. José Acevedo, St. Vincent de Paul Parish, Attleboro; Elizabeth Johnston, St. Mary Parish, Mansfield; Anthony J. Karpinski, Jr., St. Mark Parish, Attleboro Falls; Helen Keough, Our Lady Queen of Martyrs Parish, Seekonk; Corrine Lupoli-Joyce, Our Lady of Mount Carmel Parish, Seekonk; Jeanne MacDonald, St. John the Evangelist Parish, Attleboro; Herbert McEvoy, Sacred Heart Parish, North Attleboro; Laura Vergow, St. Mary Parish, Norton; John Vigorito, St. Mary Parish, North Attleboro; and Mary Irene Vincent, St. Theresa of the Child Jesus Parish, South Attleboro. Paul Carney, St. Elizabeth Seton Parish, North Falmouth; Lisa Chalke, Corpus Christi Parish, East Sandwich; Jean Clark, St. Joan of Arc Parish, Orleans; Fran Coco, St Peter the Apostle Parish, Provincetown; Barbara Cormier, Our Lady of Lourdes Parish, Wellfleet; Jovina Santos Dean, St. Margaret Parish, Buzzards Bay; Valerio L. Destefani, Good Shepherd Parish, Vineyard Haven; Michael J. Donly, St. Anthony Parish, East Falmouth; Hugh Drummond, Holy Trinity Parish, West Harwich; John Fuller, St. Patrick Parish, Falmouth; James Hines, Our Lady of the Assumption Parish, Osterville; Anne Fusco Lemaitre, Our Lady of the Cape Parish, Brewster; James Livingston, Christ the King Parish, Mashpee; Barbara Murphy, Our Lady of Victory Parish, Centerville; George Pereira, St. John the Evangelist Parish, Pocasset; Dorothy R. Scarlett, St. Pius X Parish, South Yarmouth; Erik Wendelken, St. Mary/Our Lady of the Isle Parish, Nantucket; and Monica Wieting, Holy Redeemer Parish, Chatham. Also, Anne Marie Menard, St. Thomas More Parish, Somerset; Manuel Miranda, St. Francis of Assisi Parish, Swansea; Helena Pacheco, Espirito Santo Parish, Fall River; Aida Reis, Good Shepherd Parish, Fall River; Monique Robinette, Holy Trinity Parish, Fall River; Jose Sobrinho, St. Mary Cathedral Parish, Fall River; Donatilde Sousa, St. Michael Parish, Fall River; Auracelia Souza, Our Lady of Grace Parish, Westport; Urania Tabicas, St. Anthony of Padua Parish, Fall River; Carlos Tavares, St. John of God Parish, Somerset; and Robert Tripp, St. John the Baptist Parish, Westport. Also, Anne Medeiros, St. Francis Xavier Parish, Acushnet; William O’Neil, St. Julie Billiart Parish, North Dartmouth; Joseph E. Paiva, St. Rita Parish, Marion; Dorothy Roncka, Our Lady of Perpetual Help Parish, New Bedford; Harriet Servais, St. Lawrence Martyr Parish, New Bedford; Theresa Marie Souza, St. Francis Assisi Parish, New Bedford; Edward Souza, Immaculate Conception Parish, New Bedford; Carol Sylvia, St. Mary Parish, South Dartmouth; and Sharon Vieira, Holy Name of the Sacred Heart of Jesus Parish, New Bedford. Lois M. Achtelik, St. Nicholas of Myra Parish, North Dighton; Kathleen A. Bendixen, Immaculate Conception Parish, North Easton; Kevin Brennan, Holy Cross Parish, South Easton; Jean Desrosiers, St. Jude the Apostle Parish, Taunton; Kathleen Duarte, St. Andrew the Apostle Parish, Taunton; Gabriel Leitao, Brazilian Apostolate at Holy Rosary, Taunton; Jeannette Marie Paige, Annunciation of the Lord Parish, Taunton; Thomas P. Quinn, Holy Family Parish, East Taunton; and Beverly Vargas, St Ann Parish, Raynham.